If you're new to commuting by bike, we can help you to get started. We provide free cycle training sessions including riding your route with a cycling "buddy". This helps to build confidence and the skills needed to ride in commuter traffic. 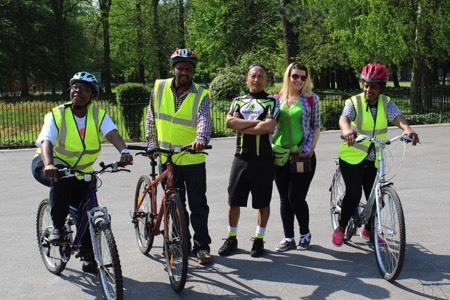 Find out more about TfGM cycle training. We can help you to apply for cycle-to-work schemes which let you buy a bike, tax-free over a year. Payments are taken directly from your salary or wages before tax. Are you an apprentice and living in Greater Manchester? If so, you could be eligible to receive a free bike to assist you on your commute to work. Find out more about the cycling support available to apprentices. If you're starting a new job after being unemployed, we can help you to get a free, recycled bike and other cycling equipment. Find out more about the bike back to work scheme. For more information on Bikes for Business, email business.travel@tfgm.com. There are many benefits from having cyclists as part of your workforce. Generally, cyclists are happier and healthier than average, take less time off work and don't need a car parking space. Become a 'workplace cycling champion' to help share information and encourage your colleagues on to their bikes.